Developer Tony Giarratana made a splash nearly four years ago with plans for what morphed into a proposed 70-story condo and hotel project on Church Street at Fifth Avenue North. The much-ballyhooed Signature Tower was supposed to be the tallest building in the nation outside New York and Chicago. Now, with credit markets in disarray, Giarratana has decided to downsize the project as he continues to search for financing to build it. Instead of 70 floors and as many as 600 condo units, look for a smaller Signature Tower with no more than 90 to 100 condos. * The average size of Signature condos will more than double from original plans of roughly 1,500 square feet each to about 3,500 square feet. * Prices haven’t been set yet, and neither has a timetable for construction. * But the final design will be one that targets the luxury market. “The average price will be substantially more; there will be fewer units but much larger individual units,” Giarratana said during Tuesday’s “Lunch Money” Webcast at Tennessean.com. Giarratana said the U.S. recession killed the glitzy 70-story Signature Tower plans, but he still plans to bring a revised concept to fruition. “I’m glad I’m not coming online with 400 to 600 high-rise condominiums right at this particular moment. The market has changed …and we’ve re-evaluated the project,” he said. 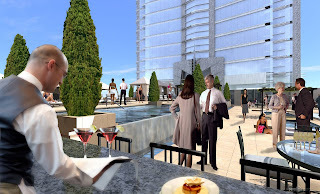 “The next reiteration you see of Signature Tower is going to be very luxurious – 3,500 square feet average units. You’ll see the same great architecture, a little bit shorter and a completely different design. No floor plans from the original concept will survive,” Giarratana added.